Can someone without specific academic qualifications or experience in journalism and no financial resources but with just a dream, launch an industrial magazine and run it successfully for 50 years? 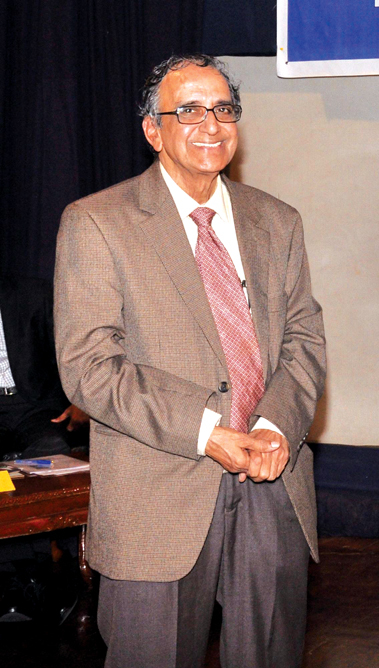 S. Viswanathan (SV), founder Editor & Publisher of Industrial Economist (IE), dared to do this. SV will be celebrating two landmark events in his life in 2018; his 80th birthday in January and the golden jubilee of IE on March 15th. After Loyola and Vivekananda, where he got a BA (Hons) degree in Mathematics and a Masters in Political Science with Economics, he joined the Directorate of Industry & Commerce and got trained in government’s systems. Then followed a few years of teaching Mathematics at the Jayanthi Tutorial College, IIET, Loyola College and Madras Christian College. SV’s first brush with writing and printing happened during this period. His association with the Social Service Centre, Mambalam, provided him the opportunity to work on social issues like hygiene, and nutrition, and bring out a souvenir for the Centre. It was a good experience in editing, advertising and marketing. He also got involved with music and literary activities. These brought him in touch with Krishna Srinivas (KSri) who was publishing two magazines, Indian Industries and Poet, both printed at his printing press. Impressed by SV’s work, KSri invited him to help him run the magazines and the press. Armed with the knowledge gained working with KSri, Viswanathan decided to turn entrepreneur at a very young age. He was only 24 when he launched in 1962 the monthly magazine Mobile devoted to the transport industry. He got guidance from S.N. Ramasami of the TVS group. He travelled around the country interviewing the leading lights of the automobile industry for Mobile and seeking the advertising to support it. Less than two years later, he started another trade magazine, Trade Wheel, devoted to the two-wheeler industry. An important breakthrough came when he traded advertising space for a round-trip ticket to Europe with PanAm. He used his connections with the Press Bureau of German Industry in India to get the opportunity to visit the six renowned German companies that built the Rourkela Steel Plant and the German government helped him to visit Daimler Benz, Volkswagen, the Hanover Fair etc. He then went to the UK. The trip also led SV to phase out Mobile. He explains: “India was then producing in three automobile plants less than 20,000 cars a year. Volkswagen was producing in a single plant 6,200 cars a day! I decided to widen my canvas and bring out an ‘industry based-magazine focused on South India’.” At the same time there was an opening up of a window of opportunity: economic journals from Kolkata (Capital), Delhi (Eastern Economist), and Bombay (Commerce), all industry-owned publications, had folded up. And, so, Industrial Economist (IE) was born. The first issue of IE was released as a fortnightly on March 15, 1968. It had 36 pages, a cover price of 75 paise (annual subscription Rs. 15), and a print order of 2,000 copies. The cover page carried a cartoon by Thanu and the inside pages featured well-researched articles/reports on industry, commodities, stocks, trade etc. These were based on information culled from company reports, plant visits and interviews with company executives. IE was well-received. Thanu and, later Gopulu, embellished the cover and inside pages in the early issues. In the early years, SV’s brother S. Narayanan and colleague P.S. Ramamurti looked after advertising. Veteran journalist P.R. Srinivas was the Consulting Editor. P.A. Seshan and T.V. Anantharamaseshan of The Hindu lent invaluable guidance. Dr. P.S. Lokanathan and Chitra S. Narayanaswamy were among the regular contributors. And SV’s parents pitched in too. According to SV, the concept of the ‘Advertorial Supplement’ on a particular topic/event introduced by IE was the first of its kind in business journalism. The supplements had anywhere from 24 to 80 pages. The first supplement was on the inauguration of Madras Refineries Ltd. in September 1969. It was a part of the regular issue of the magazine and carried special features on the prestigious plant built with multinational involvement. MRL ordered 5,000 copies of the supplement for distribution. It was a good business idea and IE has produced over 100 such supplements. A few of these were truly outstanding; the one on the Sakthi Group won 2,55,000 reprints, and on Ashok Leyland 85,000. The growing business necessitated shifting the office from his home in T’Nagar to a 4,000 sq. ft. rented premises in Gopalapuram in 1973. With the move also came the idea of expanding the press. SV imported a printing machine from Germany and a linotype machine from the USSR. These got caught in the red tape involved in imports at the time. By the time he installed these, along with a couple of Indian machines, technology had changed. Letter-press became obsolete and computers took over. SV struggled for a decade before deciding to quit the printing business! Even while SV was fighting a battle on the business front, burdened with term loans, he was fast gaining recognition as an economic editor. He started getting invited to the annual Economic Editors’ Conferences hosted by the Union Government in Delhi, and which provided for interactions with Central ministers and senior civil servants. From 1973, SV was, for several years, the sole representative to focus on southern economic issues, like demanding the expansion of Neyveli Lignite Corporation and successfully pursuing it. SV has attended these conferences for the last 44 years, a record indeed! SV used the Delhi visits to go to projects in North, West, Central and East India. He has the distinction of covering projects in all Indian States except J&K and Assam. In 1985, SV switched to electronic/computer typesetting and desk top publishing/digitisation. Eight years later, IE celebrated its Silver Jubilee. To commemorate the 1993 Silver Jubilee, IE instituted the first ever Business Excellence Award for a corporate in South India. He formed an independent awards committee to make the decision. The Awards were discontinued in 2001 when SV found the mushrooming TV channels in Delhi presenting a plethora of awards. In 1994, SV decided to go public. His company IE became a unit of the new company, Economist Communications Ltd. In the early 1980s SV moved to rented property in Guindy Industrial Estate. When new sheds were built there, he got allotted a 2,500 sq.ft. shed and, in 2001, 5,600 sq.ft. land. Foreseeing the transformation of Guindy into a large commercial hub, he raised a sophisticated commercial building with design by C.N. Ranganthan (C.R. Narayana Rao architects) and construction by L&T. In a record seven months, Economist House was built. It incorporated several sophisticated features: total rainwater harvesting, double glazed windows, roof-top solar power, sensor-based lights in toilets, security cameras etc. With steady rent coming from lessees, SV has been able to bring out IE regularly, modestly supported by advertising. Importantly, he has been able to be independent. SV fought a long legal battle to win the right of journalists to be critical of corporates. The magazine today covers a readership of 75,000. Married to Padma for 46 years, SV has a son, Bala, and daughter, Sangita, both of whom are settled in the U.S. Both cut their teeth in journalism and communication at IE, like many others who were groomed by SV in economic journalism. Neither of them, however, is interested in taking over the mantle from their father. To celebrate its Golden Jubilee, IE plans to have a seminar spread over a day with sessions on the economy, industry, agriculture and technology-innovation followed by a public function in the evening. The focus will be on the South. It promises to be one of the major events of the new year.